The Avo­lites Are­na is the ide­al desk for fes­ti­vals, the­atres and any­where that a larg­er con­trol sur­face is required. It com­bines the pop­u­lar inter­face of the Tiger Touch II with more live con­trol than ever before. Along­side the vibrant main dis­play, a sec­ond touch screen pro­vides an addi­tion­al work­space win­dow, also labelling the adja­cent macro but­tons and rotary pots. These ful­ly assign­a­ble play­back encoder pots, allow intu­itive con­trol of chan­nels and effects. 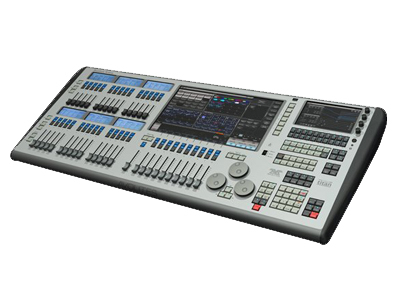 The six LCD screens dis­play elec­tron­ic leg­ends for 30 faders, for speedy access to all your play­backs, fix­tures and palettes. A brand new opti­cal out­put means the Are­na is equipped for fibre con­nec­tions, with no sig­nal loss over long dis­tances, from front of house to the stage – essen­tial in large and out­door venues. Offer­ing seam­less Mul­ti User com­pat­i­bil­i­ty, the Are­na can be used as mas­ter, back-up or extra pro­gram­ming sur­face, con­sid­er­ably cut­ting your pro­gram­ming time by allow­ing mul­ti­ple Titan pro­gram­mers to work simul­ta­ne­ous­ly, before the main con­sole takes charge. 40 pre­ci­sion play­back faders in three page­able groups. 20 pro­gram­ma­ble macro execu­tor buttons. 3 met­al shaft opti­cal attribute encoders. 4 opti­cal play­back encoder pots. 15.6” vibrant main touch screen with bright­ness control. 7” vibrant sec­ondary touch screen. 6 mono LCD screens for dig­i­tal fad­er legends. 8 phys­i­cal 5-pin XLR opto-iso­lat­ed DMX out, up to 16 uni­vers­es over Art­Net or stream­ing ACN – total of 8192 con­sole channels. Com­pat­i­ble with Titan Net – up to 64 uni­vers­es, total of 32,768 sys­tem channels. 4 Ether­con Giga­bit pri­ma­ry net­work con­nec­tion with a bat­tery main­tained man­aged switch sup­port­ing Titan Net, Art­Net and stream­ing ACN. 1 Ether­con Giga­bit sec­ondary Net­work con­nec­tion for Titan Net, Art­Net and stream­ing ACN. 1 stan­dard Opti­cal­CON stage link out­put, to con­nect to indus­try stan­dard net­work switch­es with opti­cal support. SMPTE Timecode/​LTC input 3-pin XLR (trans­former isolated). Trig­ger inputs on ¼” jack, suit­able for foot switches. Head­phone 3.5mm jack con­ve­nient­ly placed on the front panel.